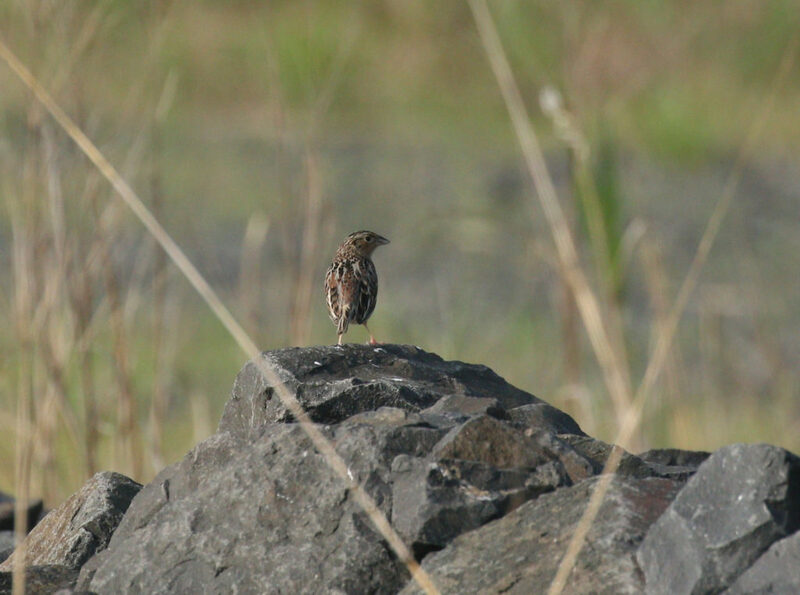 Freshkills Park’s grasslands represent a suitable habitat for birds like the grasshopper sparrow. At a time when grasslands have drastically declined across the country, the reclaimed land at Freshkills Park is providing a habitat for grassland bird species. Because grasslands are favored for agricultural production, they have largely been converted into cropland and pastures. In the United States, grasslands have experienced a decline of over 98 percent, qualifying the ecosystems as critically endangered. As grasslands are converted into agricultural land, many species that rely on grassland habitats are threatened. The disappearance of grasslands in North America has been accompanied by a widespread and ongoing decline in grassland birds. In the Northeast, grassland bird species were most frequently listed as endangered or threatened over any other type of bird species by the early 1990s. Grassland birds are particularly vulnerable because they live in one of the most variable ecosystems in North America. They are also particularly sensitive to habitat fragmentation because they require large, unfragmented expanses of vegetation in a uniform successional stage in order to survive and reproduce successfully. At about 2,200 acres in size, Freshkills Park represents the only suitable habitat in New York City for many grassland bird species. 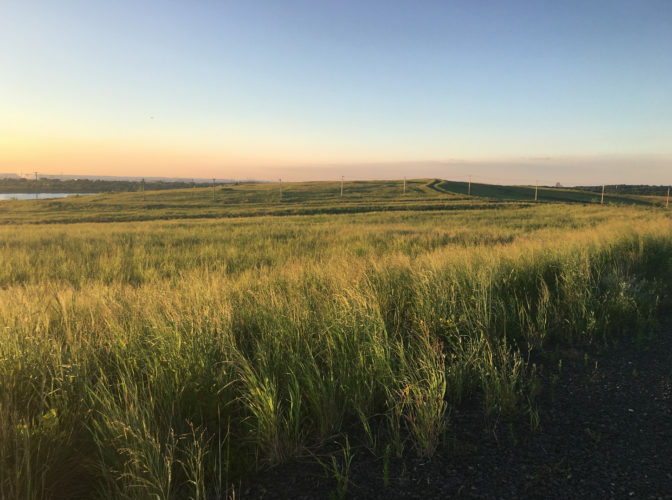 The park’s hills are built on top of the Fresh Kills Landfill, which means that the project has created a new engineered landscape. Each of the four mounds of garbage is capped with layers of soil as well as an impermeable plastic layer in order to prevent landfill byproducts from migrating into the surrounding environment. The hills are seeded with a native plant mix and mowed annually to maintain a grassland habitat by preventing forest succession. As the park is reclaimed as a grassland environment, a variety of bird species have been spotted, replacing the thousands of seagulls that once visited the landfill. Based on New York State classifications, researchers have already seen 3 endangered, 9 threatened, and 7 special concern bird species at the park. These include sightings of bald eagles and bobolinks, as well as several pairs of nesting ospreys. Research in the spring of 2015 yielded estimates of 200 nesting savannah sparrows breeding, foraging, and displaying territorial behavior at the park, as well as 60 nesting grasshopper sparrows. The appearance of the grasshopper sparrow is particularly notable because the bird has experienced a population decline of 65 percent over the past 40 years. Freshkills Park represents a suitable habitat for this bird because it is large enough to support the minimum of 350 acres that the sparrow requires. Other grassland bird species observed include red-winged blackbirds, eastern meadowlarks, and horned larks. Staff are working to better understand the behavior of grassland bird species at the park. A recent study conducted by Environmental Monitoring Intern Jocelyn Zorn observed the differences in vegetation between two sections of the park in order to figure out why some birds are preferring one particular section. It was determined that plant species density and composition likely have a notable impact on which areas of the park grassland bird species prefer and even on encouraging the return of these species. Different soils could also have an impact on habitat suitability by supporting a wider variety of macrofauna that birds prey on. These observations will help inform future design plans in order to encourage the success of grassland bird species. For more information about research projects at Freshkills Park, visit the Scientific Research page.